We have unfortunately had a schedule date change for Boys Soccer. Originally this was scheduled for Tuesday, 10/2 @ 5:00. This has now been changed to Monday 10/1 @ 5:00. Thanks for your understanding and I apologize for the change. Go Aggies! 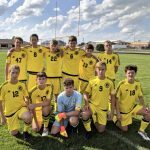 Boys Varsity Soccer · Sep 25 Soccer Game time change for 9/25 ATTENTION!! The soccer game tonight will be starting between 5:00 and 5:15 now. I am so sorry for the inconvenience and changes. Go Aggies!